HLL Notification is out. HLL is recruiting for Not Specified. Manager and Trainee Post Posts. You can check HLL - HLL Lifecare Limited last date, download HLL notification, visit HLL official website and check other HLL Vacancy details.Complete Vacancy and recruitment Details about Not Specified. Manager and Trainee Post vacancies in HLL are provided below by JobSarkari.Com only for you. Total Vacancies : Not Specified. Last Date for Receipt of Application Form 26/07/2018. Formulation & Development / R & D / Regulatory Affairs of Pharmaceutical industry. Max 35 Years. Not Specified. Quality Control / Quality Assurance of Pharmaceutical industry. Max 35 Years. Not Specified. Pharmaceutical industry. Max 35 Years. Not Specified. Scheme) Candidate Must Have Passed B.Pharma or B.Sc(Chemistry / Microbiology) With 60% Marks. Max 30 Years. Not Specified. Total No of Post Not Specified. 4.Candidate Need to Send the Application Form Along With CV , Passport Size Photo and Required Certificate to the Address Given Below. Senior Vice President (Operations), HLL Lifecare Limited, Kanagala - 591225, Hukkeri Taluka, Belgavi District, Karnatak.On or Before 26th July 2018. Q. 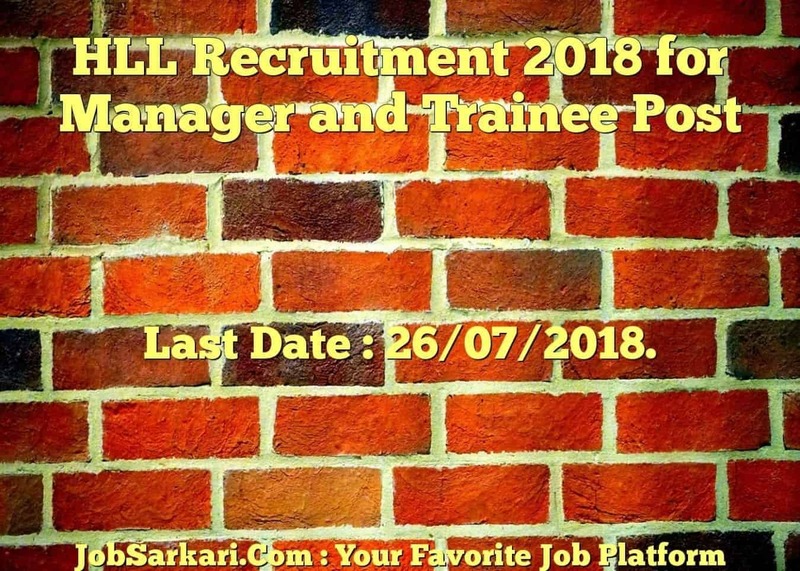 What is the Last Date For HLL Manager and Trainee Post Vacancy ? A. 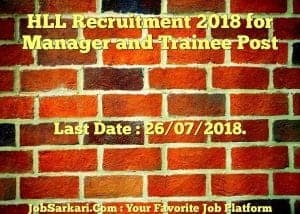 Last Date for HLL Manager and Trainee Post Posts is 26/07/2018..
Q. What is the Form Type of HLL Manager and Trainee Post Recruitment ? A. The Form Type for HLL Manager and Trainee Post Posts is Offline. Q. How many vacancies are available in HLL Lifecare Limited Manager and Trainee Post Posts ? A. There are about 0 Vacancies in HLL Lifecare Limited Manager and Trainee Post Posts. Q. What is the Full Form of HLL ? A. Full Form of HLL is HLL Lifecare Limited .